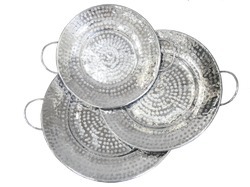 Providing you the best range of aluminum centerpiece tray, round serving tray, casted aluminum tray with handles and aluminum hammered tray set with effective & timely delivery. Our company is engaged in offering high quality Aluminum Centerpiece Tray to our prestigious customers. The offered products are manufactured from fine grade aluminum that is sourced from reliable vendors. Precisely designed in compliance with the industry set standards, the offered trays are widely used for carrying different things. 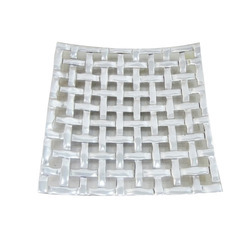 To ensure high standards of quality, the offered tray is manufactured using latest machinery. Owing to the vast experience in this field, we have been able to offer Round Serving Tray to our esteemed customers. Manufactured from high grade aluminum, the offered products find wide application in household kitchens, office, restaurants, canteens, and food court. Available with us at cost effective market prices, the offered trays are widely used for holding food items. The offered trays are available in various sizes that suit the requirements of our customers. 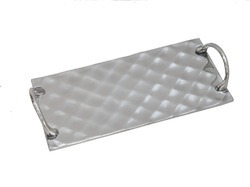 We offer a wide range of optimum quality Casted Aluminum Tray with Handles to our customers. Procured from well known vendors, the offered products are manufactured from high grade aluminum. Widely used in the kitchen for holding food items, the offered products enhance the décor of the kitchen. The handle offered with this tray help in comfortable griping and holding of this tray. 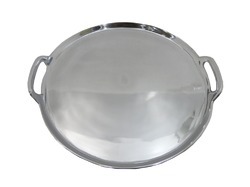 We are one of the leading manufacturers and exporters of high quality Aluminum Hammered Tray Set. Manufactured using latest equipment, the offered products are used to carry food items. Commonly used on different dinner and dessert tables, this hammered tray set offers elegant and classy look to the dinner table. In addition to this, the offered trays are available in bulk with tamper proof packaging.